"Xmas Time Is Fear" is the sixth comic issue, which was released 24 October, 2001 in the US. The Robot Mafia trades their list of marks to the Robot Devil in exchange for immunity from Santa. The Professor announces that for his community service, the staff will be performing The Story of Xmas. Bender leaves to receive a prize a lifetime supply of beer he won. The prize was a fake, Robot Devil offers Bender $5 for each person he can get to times square on Xmas Eve to meet Santa who's been re-programmed. The crew continue rehearsal and on TV Nixon confirms the Robot Devil's story. Bender continues to spread the good news, but meets up with Fender who got a better deal, so he heads back to see the Devil. Bender sees the Devil talking with a head-in-a-jar about the plan involving a still evil Santa, and captures it on tape. He informs the others and the crew head to √2 News to give Morbo the exclusive. Nixon interupts and insists they broadcast from the White House. Santa intercepts them in the limo. They awaken in the Robot Devil's torture chamber, where it is revealed that this was all part of Nixon's plan to look heroic before starting his re-election campaign. However, Robot Santa and the Robot Devil begin fighting over the vice presidency they were both promised. Fry, Leela, Bender and Nixon escape in time to appear in the last scenes of the play. Kif is in the background yet again. The Story of Xmas is performed by the staff of Planet Express. It appears to involve the birth of Zombie Jesus, Ebenezer Omicronian, the wise Omicronians, the monolith, six ghosts and Mom (played by Amy). A nativity scene is in the background of one shot, Zombie Jesus' mother appears to be a fembot. The Salvation Army now collects weapons for the defenseless to protect themselves on Xmas Eve instead of collecting money. Santa and the Devil are on each other's lists. 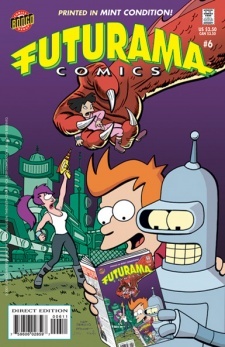 The background of the comic's cover is a mirrored duplicate of a background from near the end of "I, Roommate" where the police were searching for Bender's antenna. Professor: Well, we should get back to our rehearsal. Leela, how about we block your love scene with Zoidberg? Fry: Leela, don't you get it? This is what Xmas is supposed to be like! Besides, why would Nixon lie? As Fry and Bender are walking to 666 Dante's Circle, Fry's hands are colored the same as his skin whereas his hands are drawn as if he is wearing gloves. H.G. Blob goes to the cinema where he sees 20th century classic horror The Blob. He enjoys seeing the blob devour people. Someone insults H.G., calling him the Blob's cousin so he does what comes naturally. First appearance of Mrs. Blob.